Yeehaw! Its here!! The Rafflecopter Giveaway Round-Up, hosted by Simply Stacie and Makobi Scribe with 125+ blogs all hosting giveaways using Rafflecopter! This makes for quick and easy entries. There will be a cumulative value of over $3200 in prizes between September 21-25. Check out our Coke Family Night post and enter here to win! Good luck! 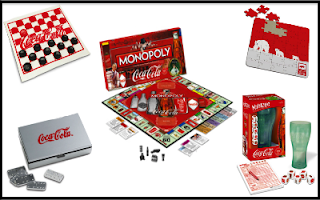 Coca-Cola is offering a Game Board Prize Pack ($100) to one of Whirlwind of Surprises' readers. Its amazing! The lucky winner will receive 1 $25US AMEX Card to pick up all the snacks and supplies you'll need, 1 Coca-Cola coupon, 1 Yahtzee Board Game, 1 Monopoly Board Game, 1 Coca-Cola Polar Bear Puzzle, 1 Checkers Mat, 1 Set of playing cards. Yes, ALL coke-themed! Trust me, I'm drooling over this kit. Enter soon as part of the Rafflecopter Round-Up Event! Open to US and CANADA. Disclaimer: The product/s mentioned above have been provided by Coca-Cola for the purposes of this post. No other form of compensation was received. The prize is provided by the Coca-Cola Company but The Coca-Cola Company is not a sponsor, administrator, or involved in any other way with this giveaway. All opinions expressed in the post are my own and not those of The Coca-Cola Company. Please view my full disclosure. Hop to these other blogs for more fantastic giveaways and please take the time to check out the other giveaways on WOS. My favorite family activity is food shopping with my dad. We love picnics in the park. Fav. family activity would have to be movie night. Mom and I love to watch movies together. Our favorite family activity is going to amusement and water parks! Next would be movie and game night. :) Thanks for the giveaway! My favorite is when we are all around the table together. My favorite family activity is riding bikes. Our favorite activity is definitely the park. There's a huge one near our house. My kids don't even play on the playground for long, they would rather run around the big football field that's there. in summer we go to the pool or park. or game or movie night. We love having family movie night every other Friday! Our fav activity is riding bikes together, or eating dinner together. Our favorite family activity is walking around the local old provincial park when we visit my mother! The chickadees are so friendly they will land in your hands! We enjoy watching a movie together every once in a while! Currently my favorite family activity is sleeping! LOL but when the girls get older I hope to do a weekly family game night! our family love to play games and watch movies together. We love going to the beach together! We love vacations.. going to the movies. My favourite family activity is a day of outdoor play at the soccer fields! We love to watch movies together. Favorite activity is backyard cookout on the 4th of July. We love to play a game called Carcasonne. My son isn't old enough to join in yet, but I hope he will love it too. My favorite family activity is playing Wii - so fun! Mostly we are movie buffs! We have family game night every Sunday night as a way of catching up on everything since our weeks are so busy! I hope my children cherish this tradition and continue it when they have families of their own! Hmm. My favourite family activity? That's a hard one. The kids and I love going to playgroup but my hubby doesn't go. Maybe camping? My favorite family activity is family bike rides. Playing sports or games and sightseeing in our own city! We love to do this as a family. Our Favorite activity is Camping and Hiking. We like having a picnic at the playground/waterpark! I like to go hiking and doing puzzles. Going out in our boat or heading out to the park. We play a lot of board games in the winter time.... and spend almost every waking moment outside in the summer. I love going to the playground as a family. our favorite family activities are board games! family activity is walking camping. bowl of popcorn and coke to drink. My favorite family activity is spending time outdoors with my kids. Favorite family activity is going on day trips together like apple picking next weekend! Our favorite family activity is taking short trips. Hubby travels often for work and my daughter(6) and I often join him. She loves staying in hotels and exploring the area. We love going to new places! Parks, events, or just rides! We love board games for indoors and fishing for outdoors! Our favorite activity is traveling (especially anywhere there is a beach! ), but we also love bowling, going to movies and playing games together. Eating dinner together so we can all talk about our day. With money tight we do a family dinner at home followed by a game of some sort or a walk together! we love to pop a big tub of popcorn, settle in and watch scary movies! its our fave thing to do!! My favorite activity is either playing games with the family or everyone gathered in the family watching movies! My favorite activity with family is playing card/board games or watching funny movies. We've always been big on board games and movie night. I would have to say our favorite thing to do it go to ball games. We love watching my daughter play softball or going to our local minor league baseball teams games. thank you! My kids are quite young (2 1/2 and 6 months) but currently our favorite activity is playing with play doh!! We love going to the carousel at a park near our house! We love to go camping together in the summer! Playing board and card games is my favorite family time activity. We love family game night here! we love watching and playing sports. We love playing the Wii together! We love family game night! We have it every Friday! Our favorite family activiy is spending the day out at the park or at the zoo! Favorite family activity is watching movies together. Thanks! Every Saturday during the summer my family and I go to the local farmers market and pick up our fresh produce and a little treat from the Swiss Farmer's Bakery stand. We always have a great time. We love the beach in the summer and watching movies in winter. We love playing Scrabble and watching animated movies! I like getting my (adult) kids together to have a big dinner and watch movies. Favorite family activity is actually our time spent in animal rescue. We like to play with the Wii, cards or games & having movie nights. My favorite family activities are a day at the beach or going out for super. Our favorite family activity is cooking together on the weekends. It's when we really catch-up with what's happening in our lives. We like to go watch a movie together. We love playing old games together. Anytime with family and just spending time with them is vitually important! I love going to the movies with my family. My favorite is watching movies love dvd night! My favorite activity is playing tap out with my sisters bf. My favorite family activity is our monthly movie night. I get a bunch of fun junk food and we pick a movie and play board games. This tends to bring us back together as a family! We used to have a semi-tradition of "Friday Pizza Night" which involved ordering a pizza and renting a movie. We still do sometimes but not as often. My favorite family activity is taking the dog to play Frisbee. He loves it and it is fun to watch him. We love to ride bikes together on weekends, the whole family looks forward to it! :-) Thank you. My favorite family activity would have to be fishing. We love to go to KC Royals games, though they don't always win. We love watching movies together and reading aloud! Favorite family activity is walking. My favorite family activity is game night. We live pretty close to a State Park, and we visit it pretty often. we walk there, play kiddie golf, swim and picnic, they have a lot of other things going on all the time, so I would have to say a day at the park is my favorite family activity. My favorite family activity is movie night. My favorite family activity is game night! We love camping in the backyard on Saturday night. Our favorite family activity is watching movies :) *Thanks* for the giveaway! We like watching movies and playing games. Our favorite family activity is family dinner night on Sundays. Each person takes a turn picking where to go and it's nice to get away and just be able to talk to each other. Thanks! I like to get the family out to an event or festival. It's a great to be out and walking around instead of passively sitting somewhere and you learn something. We like to go to the lake and do water activities. Our favorite family activity is Family Movie night when we rent a family DVD, bring home a pizza and have popcorn and treats while we watch the movie. we love doing anything outdoors. This summer we did a lot of kayaking. I love playing games with my family! We love to go to the park and feed the ducks and squirrels with unhealthy snacks. They seem so happy to see us when we show up. We love to take bike rides in the summer and play board games in the winter. My favourite would be to do the puzzle with my daughter. We like spending time watching a good movie. Our favorite family thing is camping. We love going to the beach! Sasha (my dog) loves to swim and dig holes. Our favorite family activity is going fishing together!